Variety, variety everywhere, but I’m just sticking with bread. A study looked to see if there was a link between the obesity problem in our Western culture and access to highly-palatable and varied food. Past research with animals has shown the link between eating more food if it tastes good (and that makes perfect sense) which leads to a pattern of obesity—as the more used to good tasting food you eat, the more you feel you need to eat to become satisfied. However, diet variety may also be linked to eating behavior and weight. Studies have shown short-term that the more variety in a diet, the greater probability of intaking more food and higher energy intake. On the other hand, eating the same foods over a period of time reduces palatability ratings and the amount of food eaten. A different study looked at strategies to improve weight loss and maintaining that loss. They found that limiting diet variety can help reduce intake and when done long term, along with other healthy-eating practices and exercise, can help with weight loss. Does this mean only eating one type of food for the rest of your life is the secret to losing weight? Probably not. The bottom line is, it seems the more choices you have when it comes to diet, the easier it is to eat more. However, keeping a simple routine can help curve cravings. Good, now that I am keeping to a schedule of running on the treadmill at least 25 mins everyday. This limited amount of exercise provides me a stress release and also kick starts my metabolism everyday without going excessively hungry. It’s done amazing things to my little muffin top, too! Which is taking the fat there and converting it to muscle mass somewhere else. I love this exercise regime, I wished I learned of it sooner. 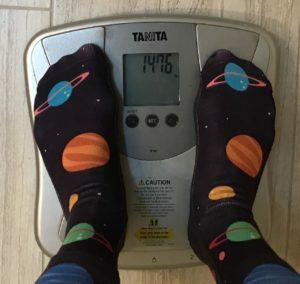 Week 10 weigh in: 142 lbs. Week 4: Have I Officially Plateaued on My Bread Diet? 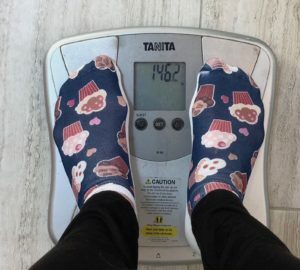 Every dieter’s nightmare is to look at the scale, and after all the hard work that you’ve put in, you don’t move the needle at all (or least reduced the numbers digitally). It only means one thing. I’ve finally met the caloric needs of my lighter self. The equation needs to be changed. Either I increase my caloric needs (through exercise), decrease my caloric intake further, or both. Every time I run a 5K, my body wants more calories and I end up eating more than I exercise. That is why most people like me don’t lose weight while performing high impact extended exercises. The output just doesn’t exceed the input. The weekends are really bad too. When I bake and cook for my family of five, I tend to dig into their share as well. So, as a mom, I really have to control what goes into my mouth. It definitely can not include macaroni and cheese or the frequent Tater Tot (my kid’s favorite). Therefore, to all the moms out there who bake and cook: I feel you. 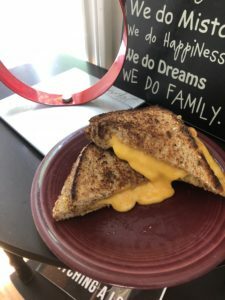 Grilled cheese on multigrain bread (not exactly a diet food). To my surprise, a study showed that the most effective weight loss can be achieved by performing no more than 30 mins of cardiovascular exercise. Seriously? All this time I thought I had to burn more to lose more and that is just not true! 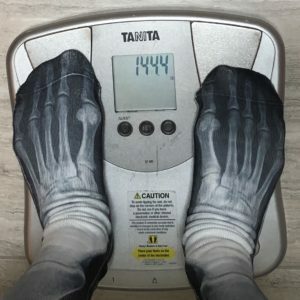 Week 4 weigh in: 144.4 lbs, same as last week. Week 1: Eating to Lose Weight is Hard. Bread Helps. 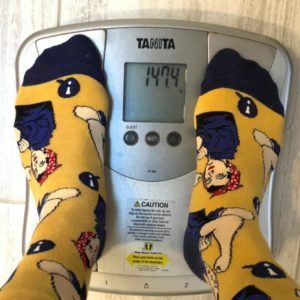 How did the first 7 days go eating to lose weight? Tough, but worth it. 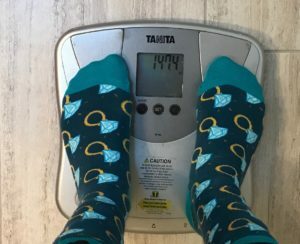 I lost about one pound. The toughest part? It is educating everyone around me on my bread diet. They bring me food and ask me to go out to lunch. And cooking meals for my family that is non-bread based is all very challenging. What’s different this time around? I used My Fitness Pal app to track all my caloric intake. 50% of my calories came from bread. My target caloric count for losing weight is about 1,500 calories per day. If I stick to this, 750 calories should come from bread, and that would mean about 6-7 slices per day! Come to think about it, 2 in the morning, 2 at lunch and 2 for snacks in the afternoon, and if I spread it out, voila! I should be able to cover all my hunger pangs. Sounds super easy yeah? Wrong. It was hard to stick to that eating schedule. You know what they say about dieting: calorie deficiency isn’t the easiest thing. Why is it so easy to put on, and yet so difficult to loose weight! So my first week was plagued by me snacking on other things other than bread. Chips here, dumplings there, and that muffin’s calling my name! So all in all, I tried to keep as close to my caloric intake goal as I can on bread to lose weight. The result? 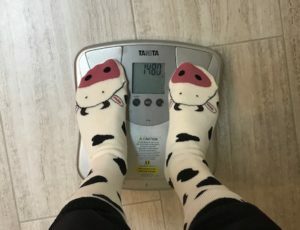 I didn’t feel hungry all the time, but the weight is not falling off as much as I thought it would. I feel this is because of all the eating I do other than bread. So I’m going to do something different next week. I’m going to really streamline what I put in my mouth and be really disciplined about it. This week I ate bread from two wonderful bakeries: Franz and Klosterman’s. Both of these products are organic, made with quality ingredients, and to top it all off, taste delicious! It’s loaves like this that will make eating bread to lose weight possible. Stop by my bread gallery to see all the breads I’ve eaten during my 90 days projects. *chocolate eggs are not part of a healthy diet. However, it’s Easter egg season, and I need my easter eggs! No wonder losing weight is so HARD! 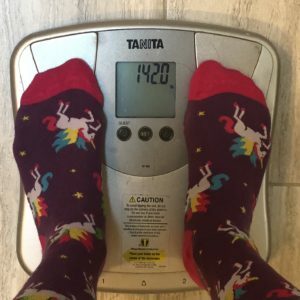 The first weigh-in: 147.4 lbs. Week 1 weigh-in: 146.2 lbs. 1 pound down, 9 more to go! NOPE! I’m just getting started. After eating a loaf of bread a day for 90 days, you may think I would be done with bread-based diets…you seriously underestimate my love for bread. You can eat a high-carb diet and not gain weight. I had heard too many times that bread makes you fat, it will make you gluten-intolerant, and grains are not meant for human consumption. However, the results backed up my claims: I did not gain any weight, maintained a healthy nutritional profile, and was not bloated or uncomfortable. The journey also sparked conversations that helped give bread a good name. I got to cover healthy bread innovations, dive into the science of grains, and gain insight on how to market bread in an anti-bread climate. 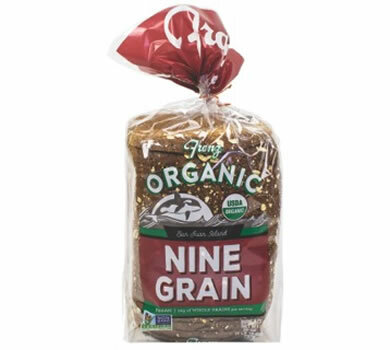 I will consume 6-8 slices, about half a pound, of bread a day to lose at least 10 lbs in 90 days. Why the focus on weight loss this time? Even if products like sprouted grain bread or whole grain bread are being recognized for their nutrition, people are still cutting carbs when focusing on weight loss. Paleo, Keto, and gluten-free are major trends right now, all focused around the idea carbs are the key to shedding those extra pounds. However, the carbs found in whole grains are actually an important part of diet. And lipid catabolism is a highly effective weight loss technique that relies on carbs. My goal is to show that along with healthy eating, portion control and exercise, you can still enjoy bread! So for 90 days, I’ll be including around a loaf of bread ad day in my diet. I’ll also be exercising, eating healthy, and documenting it all. So come along with me as I discover tasty loaves, cover bread facts, and make more bread puns than you’ll know what to do with. 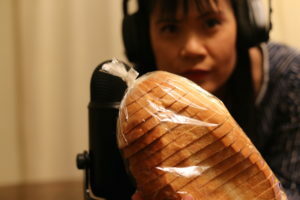 I’ll be posting weekly updates on EatBread90.com, as well as highlighting the bread I eat—feel free to follow along! 707 SW Washington St., #1100, Portland, OR 97205. Attn: Ms Ana Rinck, Operations Manager, BAKERpedia. Is This the End of My Bread Diet? What a Journey it’s Been! Honestly, it’s with a heavy heart that I agree with that statement. Mainly because I am sad I’ve come to the end of this bread diet. 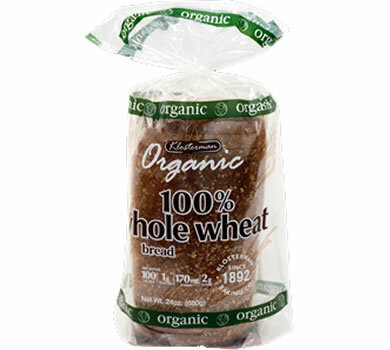 I’ve indulged in eating a loaf a day, and It’s been 90 days of non-stop eating for me to get all that bread down. I’ve eaten bread from far-away places, and more bread than anyone I know. I’m so honored to the bakers from around America, across the sea to Germany and Switzerland and all the way south from Brazil. Thank you for sending in your bread, thank you for supporting me on this journey. Thank you for assisting me in my message that BREAD IS NOT BAD. Bread is bad for you, it will make you put on weight. Do you know gluten causes inflammation in your body? Man was not designed to digest grains, eating all that bread would cause you to become intolerant to gluten. Bread is a processed food that you need to avoid. White bread is so bad for you, avoid at all cost. Guess what? None of that is true. I have not gained a single pound eating a loaf a day and my energy levels, are through the roof. The whole purpose of my journey was to disprove these biased, non-science based information on bread. I’ve eaten bread all my life, I play with it, I research it. I know the science behind it. That is why I started this journey—to eat so much bread so that I can prove that it is safe to consume bread. Is a Bread Diet for Everyone? If you suffer from diabetes, absolutely not. But don’t discount the low GI breads that I experienced on my journey. You should check those out my blog on Days 19 and 31. For people with Celiac disease, you can consume gluten-free breads and they can be found on my blogs on Days 30 and 73. For the majority of the American population, bread is a nutritious portable food that is safe for consumption. You know, I’ve received a lot of criticism concerning how I carried out my journey. One of them was, “Hey Lin, you are only one data point, that doesn’t prove anything.” Just let me be clear. I was not carrying out an experiment. I was using data and science-based information that has been generated from decades of research, to show that those experiments and nutritional information on bread work. And I’ve proven it. I want people to use the info on EatBread90.com to fight the common misconception of bread. Know that all the information we have collected here is based on science. Thus information will be great to share with your families and friends that have all of a sudden developed a disliking for bread. They somehow become this way because some website selling new age remedies has turned them away from grains and wheat. If you’re a baker, I hope you use our EatBread90 blogs to help you in your bread journey. I’ve created enough information for you to help you in your business. As you know, I have a soft spot for bakers. Check out my blogs on Days 12, 58, 62, 75, and 90 for innovative ideas. Because of you, I am working on our next project: Body by Bread. I can’t talk too much about it right now, but it does involve a community that supports bread and whose lifestyles are bread centric. So stay tuned. It’s been an awesome and life-changing journey. Thank you for reading this blog, thank you for your tremendous support. Thank you for loving bread. This couldn’t be possible without you. Thank you. I can’t believe it. Just under a week left in my ninety days. Of course, it would take until the end for me to start eating pizza. But as we draw near the end, my weight is just where I thought it would be. Are you surprised? Make sure to check back in at the end of the 90 days to see what I end up with! Well, ninety days are winding down. But the types of bread I’m learning about and great conversations are not! 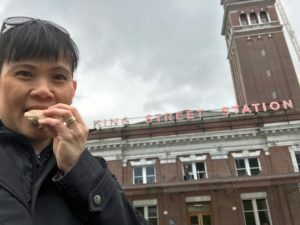 This week, I got to eat some wonderful gluten free bread, and discuss how celiac disease doesn’t mean the end of bread. There was also some amazing probiotic bread that has an innovative solution to give you a whole bunch of benefits. For a food like bread that’s been around for so many years, it’s amazing to see how how relevant and healthy it still is! Day 63 weigh-in: 148 lbs. This was an interesting and unique week in my Eat Bread 90 challenge. Due to two outpatient procedures, I was really off my game and on my back early on. However, I’m finally feeling back to my old self, and ready to finish strong as we get closer and closer to the finish line! And no, I’m not sick of bread yet. Bring it on! It seems strange to think I’m over a third of the way done with my 90 days. I’ve got about a month left of this bread eating journey, and I still have amazing breads from talented and innovative bakers rolling in. Wow! This week I got to try some really unique and tasty breads, some of which I may not have tried if not for my Eat Bread 90 challenge. Well, back to eating more bread! Traveling this week to the International Symposium on Bread made the last few days busy and full. 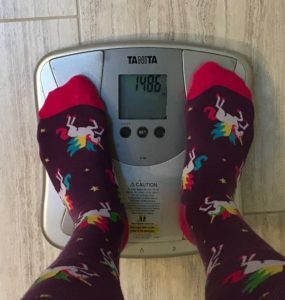 But even with flying across the country, not having time to fit in all of my regular exercise, and good food and bread everywhere, I STILL did not put on a significant amount of weight. The deeper I go into this diet, the more I get used to what works and what doesn’t, and I feel I’m really hitting my stride. Get Dr. Carson's updates about her Eat Bread 90 progress delivered to your inbox once a month! By submitting your email, you agree to receive email updates from Eat Bread 90 and BAKERpedia.